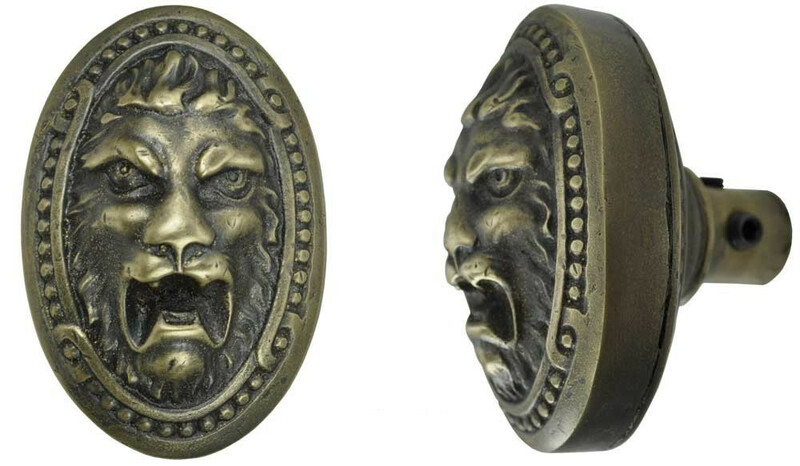 Roaring Lion doorknob by Corbin, from their circa 1900 catalog, and originally part of a series called the Pavia Pattern. 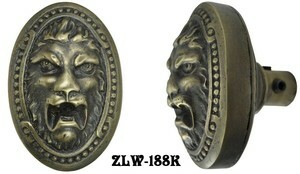 Comes in our antiqued brass finish to bring out the details. Measurements: 2" wide by 2 7/8" long. Projects 2 3/8". We have reproduced the Pavia design antique style door plate both with and without a keyhole, pictured below. This style would work well with Gothic, Classical, or allegorical character decor, too. This doorknob is sold by each, without connecting spindle. To make a set, order two knobs and our L-S5 doorknob shaft. For extra thick doors, purchase an extra long square doorknob shaft spindle (part number L-S5L) separately, which may be trimmed as needed. How far from the edge of the door is the center of your doorknob? This is the backset, and determines which latch or mortise lock you use. 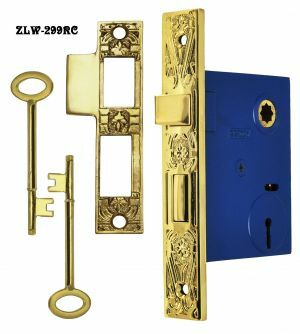 For a 2 3/8" backset, we offer our L-6 tubular latch, and a privacy tubular deadbolt latch (L-43) option. 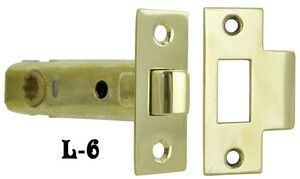 Very narrow panel doors or doors with lots of glass may need a L-6SB 1 3/8" backset passage latch.